The Advance VI program will run multiple steps. First select the com port and the baud rate for the syringe pump. This VI will not allow you to input any values until you select a Com Port. Select [x]. The options include single pump, pump channel 1, pump channel 2, and cycle mode. Select single pump if the syringe pump you are using is not a dual syringe pump. Choose pump channel 1 or 2 to communicate with that respective syringe. Cycle mode will cycle between the two pumps. Then enter the volume to run in the first step. 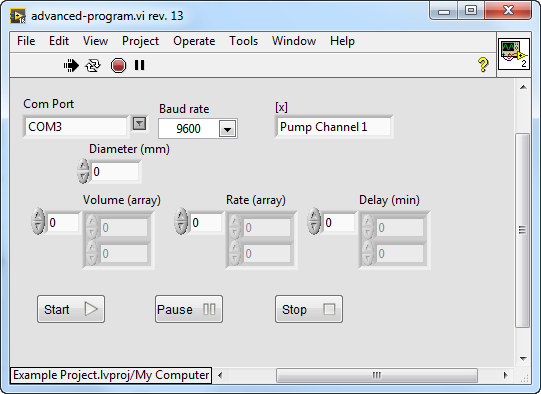 If you enter multiple volumes in the array, the pump will run multiple steps. Enter volume into the Volume (array) control. You can select a negative value for withdrawal mode. Next enter the rates in the Rate (array). Keep in mind the volume and rate must be within the limits of the pump. You can enter delays to implement before the step runs in delay (min). Press the start button to run the commands you inputted. Press Pause to pause the pump and click start to restart the pump. The pump will resume where it left off in your steps. Press Stop to stop the pump. This will reset the steps you input so if you hit start again it will start from the first step. Here is the block diagram of the VI. The first part of the code will read all the com ports available on the computer. This is used to make sure a correct com port is selected before the user tries to send any values. Creating an array of com ports may take 5 seconds to complete. The heart of the code is an event structure that sends the appropriate commands to the pump whenever a control is changed.